I've been haunted by Stephen Kijak's "Scott Walker: 30 Century Man" for two weeks now. The film itself is pretty standard biographical fare, marching through the elusive but highly influential musical career of Scott Walker. What stirs me most is the idea that I could have been blind to the talents of a singer/composer like Scott Walker for so long. I'd heard bits and pieces of his music over the years, but never in the persuasive fashion explored by the film. I've since spent more time and money than I wish to admit, collecting a majority of his music on import cd's and downloads. Simply put (by the film, not just myself) Walker is a musical chameleon... a singer/songwriter/composer who surfaces in each decade with masterful songs and a crooning baritone voice, leaving his oddities behind to push seismic ripples out into the musical universe and abruptly shifting the sound into something more adventurous. 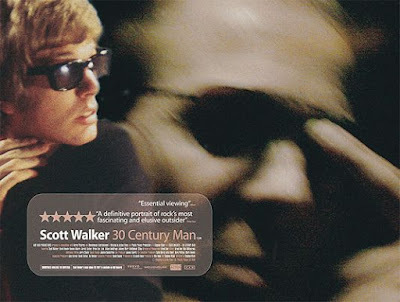 Through honest, unpretentious interviews with Scott Walker in 2004, when he was hard at work crafting his latest album which would become "The Drift", director Kijak creates a testimonial through visuals and talking head interviews (with fans and devotees such as David Bowie, Damon Albarn and Jarvis Cocker) that effectively conveys the importance of Walker's sound. The most fascinating moments involve his experimental techniques in percussion (a drummer punching slabs of meat for that thud) and the faces of the numerous collaborators, smiling and surprising themselves with little moments of the songs they'd forgotten where there courtesy of Walker. Starting at the beginning when Scott became 1/3rd of the Beatles-like pop band The Walker Brothers, things get supremely interesting as his solo career falters in the late 60's. In 1978, he reunites with The Walker Brothers and they're given a one record deal with a bankrupt record company. The first four tracks on that record, titled "Nite Flights", were penned by Scott and are routinely attributed with the praises of 'greatest 4 songs ever put on record'. That's debatable, but this is the type of hype that follows the cult status of Walker. For the record, after listening to "Nite Flights" and the first 4 tracks, they are incredibly mind blowing for 1978. So continues the life and legend of Walker. For any more notices of the guy's coolness, he contributed the soundtrack to Leos Carax's "Pola X"..... and if you've seen that film, who could forget the crescendo of thrashing guitar and metal noise? With the overview of his last two albums, "Scott Walker: 30 Century Man" really gains traction. The avant garde side of his tastes (a mixture of Radiohead, who initially titled "Creep" the Scott Walker song, and off note jazz noise) begins to shine through in 1997's "Tilt" and "The Drift" in 2006. It takes an intense state of mind to endure and listen to the moody, dark and almost haphazard way musical instruments careen and float through his latest work, but they're entirely rewarding once you break through. And that's the beauty of "Scott Walker: 30 Century Man". There's no pizazz. There's no hyped up visuals. The film presents Walker and his music in a straight forward fashion, casting a fan's air of reverie and respect over the entire effort. Like the music, if one gives in, it can be extremely rewarding. Bonus video- his contribution to 80's New Wave. Who remembers this video? I do.